This is a big book – it’s one of those giant paperbacks, and it has over 500 pages. Yet Doerr uses language with the precision of a poet. To test this out, I’m going to open it at random and see what’s there. Here we go: He looks up. Suspended lamps, rows of spines fading off into dusty gold. All of Europe, and he aims to find one pebble tucked inside its folds. And again: All morning Etienne crawls along the attic floor with cable and pliers and tools her fingers do not understand, weaving himself into the center of what she imagines as an intricate electronic net. 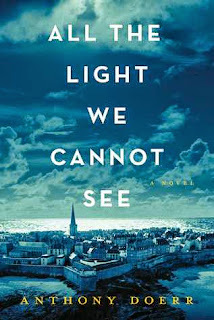 The novel is set in France in the Second World War. It weaves together the stories of two characters, and it’s difficult at first to see exactly why they will come to meet. Except, of course, that here is a continent – a world – in chaos; so that unexpected juxtapositions might almost be expected to occur. Marie-Laure LeBlanc is the subject of the first story. Blind from the age of six, at the beginning of the story she lives in Paris with her father, who works at the Museum of Natural History. He has constructed for her an exquisitely detailed model of their neighbourhood; each house, each street, each storm drain is there, so that she can learn it with her fingers and then apply her knowledge to find her way about the real city. Every day, he takes her with him to the museum, and some afternoons he leaves her with Dr Geffard, ‘an aging mollusk expert whose beard smells permanently of damp wool’. Geffard tells her about the reefs he explored as a young man, and he lets her handle the thousands of specimens he has: The murex Dr Geffard keeps on his desk can entertain her for half an hour, the hollow spines, the ridged whorls, the deep entrance; it’s a forest of spikes and caves and textures; it’s a kingdom. (This knowledge becomes important to her later on; nothing is wasted in this book.) When war breaks out and the Germans are about to invade Paris, Marie-Laure and her father flee, eventually taking shelter in St Malo, in the tall, narrow house where her reclusive Uncle Etienne lives, cared for by his redoubtable housekeeper, Madame Manec. Meanwhile, a white-haired boy called Werner Pfennig (who, we learn at the very beginning of the book, will also end up in St Malo), is growing up in an orphanage in a mining town in Germany with his sister, Jutta. Werner has an agile mind and capable fingers; he and Jutta are fascinated by radios, and he teaches himself how they work and constructs his own. He dreads the thought of working in the mines which killed his father, and when his unusual skill comes to the notice of the authorities, it seems that he may have found a way out. But in the Germany of the Third Reich, his education comes at a price; he sees terrible things and he fears that he is morally compromised. It would be unfair to say any more about what happens to the two young people – but perhaps you would like to know that this novel ultimately offers hope: it suggests that goodness exists despite evil, and even emerges and develops as a reaction to terrible circumstances. One of the many remarkable things about this novel to me is the way in which Doerr succeeds in recreating the detail and texture of life in mid-century France and Germany. It’s easy to take this for granted as a reader, but it really isn’t an easy thing to achieve. When I wrote Warrior King, my book about Alfred the Great, I did a lot of research before starting to write. But... after a couple of pages, Alfred needs to have a bit of a think before he decides what to say, so he reaches out for a drink. But a drink of what? And from what? What were cups/goblets made from in the 9th century? Metal, wood? What kind of metal? It’s those little touches, which you don’t even have to think about when you’re writing a contemporary novel, which trip you up so easily. So far as I noticed, Doerr doesn’t put a foot wrong. Here, for instance, he’s writing about what happens when the electricity supply in St Malo becomes erratic. Clocks run fast, lightbulbs brighten, flare and pop, and send a soft rain of glass falling into the corridors. How did he know that’s what happens? I would have thought the electricity would just flicker. You hardly notice such details, but they all help to create a completely authentic world. This is a remarkable novel. There’s so much in it that I know I will come back to it and re-read it, and I don’t do that often. Just one criticism, and it’s for the publisher, Fourth Estate, not the author. Usually, I find these large format paperbacks a pleasure to read. This one looks lovely, but it's incredibly difficult to handle, because the spine is so stiff that you can’t open the book properly, let alone get it to lie flat. Very annoying! For more reviews, do pop over and visit my site A Fool on a Hill. It has reviews of books for children and adults. This sounds like a wonderful, engrossing book. I'd love to read it - but perhaps on my Kindle. The problem of handling modern books needs a blog post of its own - though not necessarily here! I've become increasingly aware of it. Has the production method changed? Recent paperbacks are nearly always heavy and difficult to hold open. I don't know, Anne, but this was the worst yet - it was really difficult to see the words near the middle. Lovely review, Sue. It has certainly whetted my appetite, but perhaps as a Kindle, as Ann suggests. It's really beautifully written. Every sentence a treat. That sounds very enticing. And I do know exactly what you mean about those very practical little details and how they can trip you up as you go further back in time - the difference seventy years can make (as I've been discovering! Or even five.